Fried and stuffed with cabbage, carrots, sprouts, green onions, red and green peppers and served with spicy mustard sauce. Chicken, mushrooms, tomatoes, jalapenos, cheddar cheese and salsa served with sour cream and green onions. 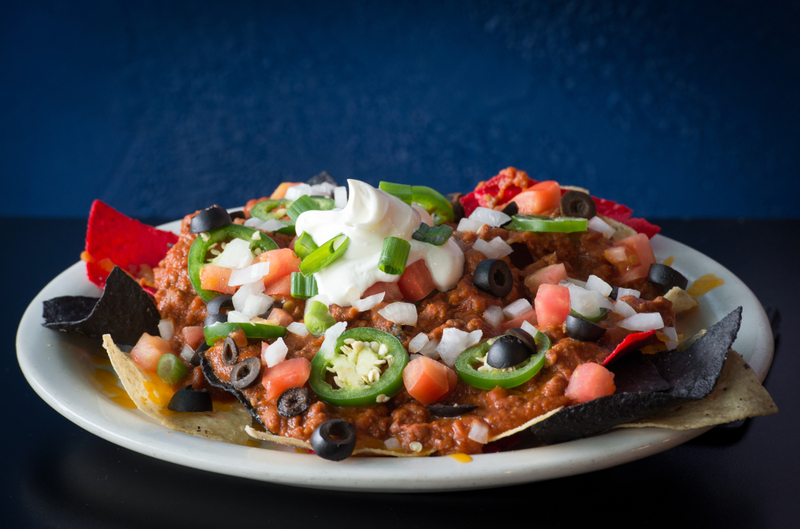 Crispy corn chips, cheddar cheese, tomato, black olives, chili and jalepeno, topped with sour cream and green onion. Served with french fries and your choice of BBQ, honey mustard, or ranch. Breaded mozzarella cheese deep fried and served with marinara sauce. Golden brown fries tossed with cajun seasoning and topped with cheddar cheese, mozzarella cheese, sour cream, jalapenos, bacon and green onions. Beer battered and served with Texas pedal sauce. Crab meat, bell peppers and spices served with horseraddish, aioli and dijionaise. Mixed greens, tomato, sunflower seeds and carrots tossed in a balsamic vinaigrette, topped with feta cheese crumbles. Romaine lettuce, garlic toasted crutons, parmesan cheese, tossed in our homemade caeser dressing. Grilled grouper with caribbean jerk seasoning, swiss cheese, egg, banana peppers, tomatoes, black olives with mixed greens and cabbage tossed with sweet and sour dressing. Fried chicken breast, bacon, tomato, hard boiled egg, avocado, onions, cheddar cheese tossed in bleu cheese dressing with mixed greens. Shredded cabbage, toasted sunflower seeds and almonds, crispy noodles and tossed in asian vinaigrette. 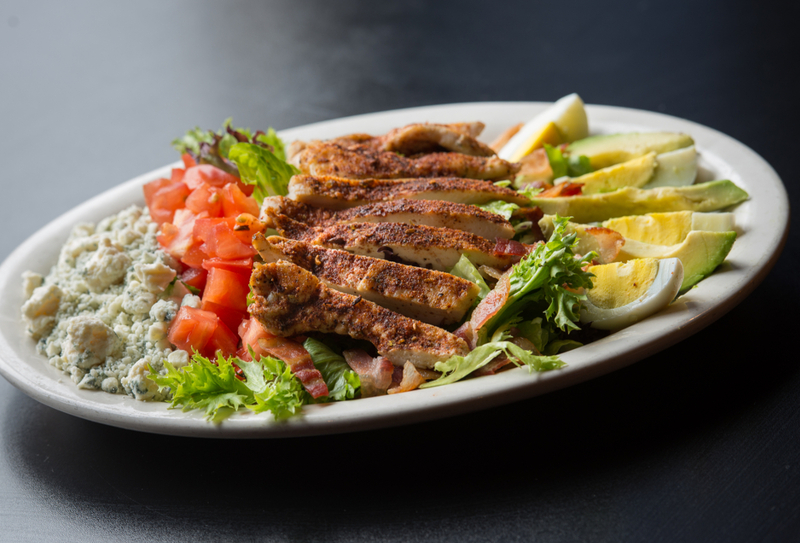 Grilled blackened chicken, avocado, bleu cheese crumbles, bacon, hardboiled egg and tomato served with ranch dressing. Our burgers are made with ½ pound choice Black Angus beef and served with Mayo, Lettuce, Tomato, Onion and Pickle Every Wednesday is BurgerMania! That means you can get any burger off the menu and a side for only $6.00! Dine in Only. 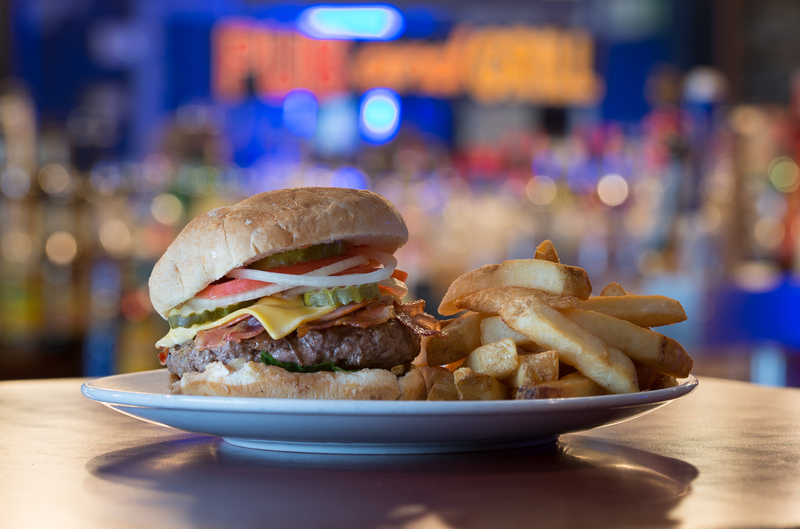 Our flagship burger is loaded with bacon, grilled onions, sauteed mushroms, capacolla ham, and American cheese. 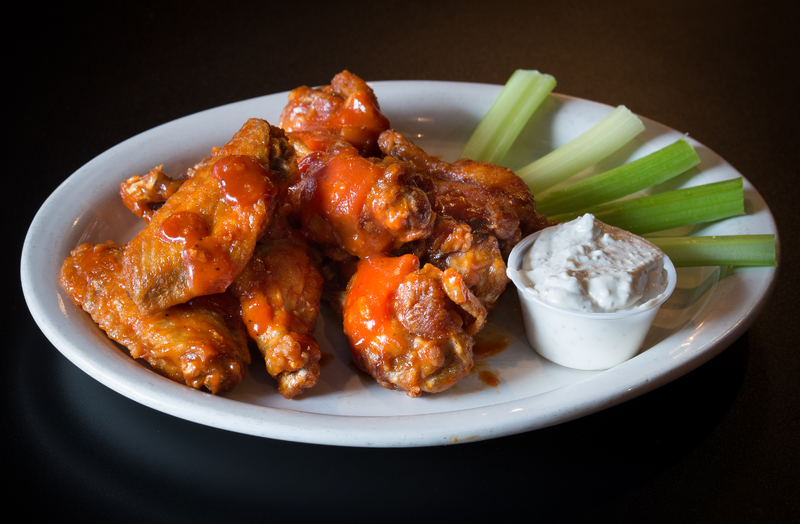 Covered in blackened seasoning and topped with our delicious, homemade bleu cheese dressing. Homemade BBQ sauce, bacon, onion straws, and cheddar cheese. 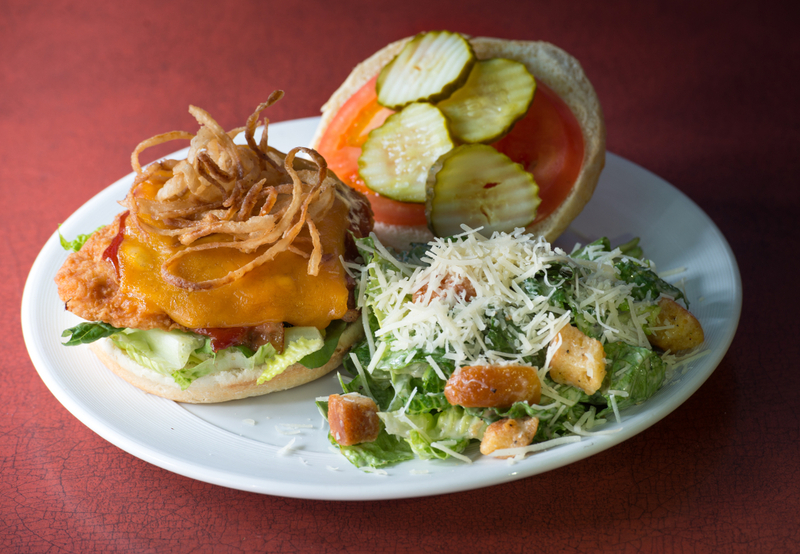 Topped with sauteed button and portabella mushrooms, and your choice of cheese. Covered in blackened seasoning and topped with bacon, banana peppers, and pepper jack cheese. Seasoned with carribean jerk spices and topped with bacon, grilled pineapple, and swiss cheese. Grilled onions, swiss cheese, 1000 island dressing on grilled rye bread. Cajun dusted with grilled red and green bell peppers, red onions and topped with feta cheese. Topped with your choice of cheese: american, pepper jack, provolone, swiss, or cheddar. Blackened chicken, romaine lettuce, Caesar dressing and shredded parmesan cheese in a flour tortilla. Smoked turkey, bacon, tomatoes, lettuce, pepper jack cheese and parmesan peppercorn ranch dressing in a flour tortilla. Smoked turkey breast, bacon, provolone cheese, salami, pepperoni, lettuce, tomato and mayo served on a ciabatta bun. Grilled marinated portabella mushrooms, green and red bell peppers and topped with lettuce, tomato, red onion, pickle, provolone cheese and horseradish aioli. Fried or grilled chicken, shredded lettuce, tomato, bleu cheese dressing and buffalo sauce in a flour tortilla. Grilled chicken breast with cajun seasoning, bacon, cheddar cheese served on a kaiser roll with lettuce, tomato, onion, pickle and chipotle mayo. Grilled lamb and beef, tomato, lettuce, tzatziki sauce, onion and feta cheese served on toasted pita bread. Fried chicken breast topped with honey mustard, bacon and swiss cheese served with tomato and lettuce on a kaiser roll. Grilled marinated portabella mushrooms, roasted red peppers, artichokes, mixed greens, red onions, provolone cheese and chipotle mayo in a flour tortilla. Choice of grilled with blackened or lemon pepper seasoning, or deep fried, served on toasted marble rye with lettuce, tomato, tartar sauce, onion and pickle. 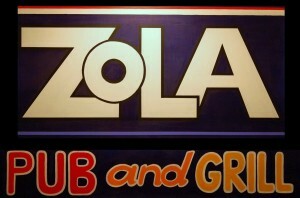 © 2019 Zola Pub and Grill. All Rights Reserved.